Who doesn't like aromatic, spicy, dum cooked biriyani. Usually biriyani is made with chicken, mutton, mixed vegetables etc. 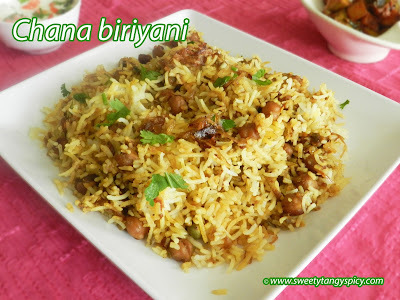 Still there is one more tasty biriyani for vegetarians, the chickpea biriyani or chana biriyani. Biriyani with chickpeas, sound a little bit strange, but trust me it is awesome. I think, this biriyani is not that much popular in south India, am I right? The chickpeas cooked in common Indian spices and layered with aromatic basmati rice, which is then dum cooked to get delicious, mildly spicy biriyani. You can use the common dum process. But I used the easiest method of dum cooking, but not the traditional one. 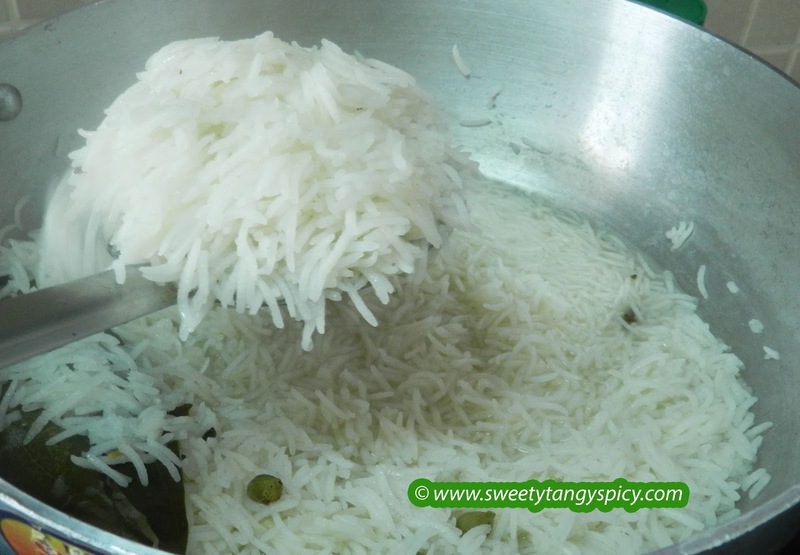 I am not using any curd or coconut in this recipe, If you want, you can surely incorporate this just like other biriyani recipes. 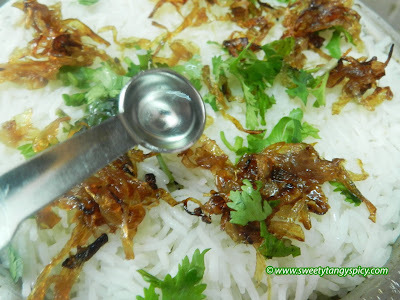 In spite of the use of curd and coconut, this recipe gives a really tasty biriyani. Soak 3/4 cup chick peas overnight or for 7 to 8 hours in normal water. Then strain and keep aside. 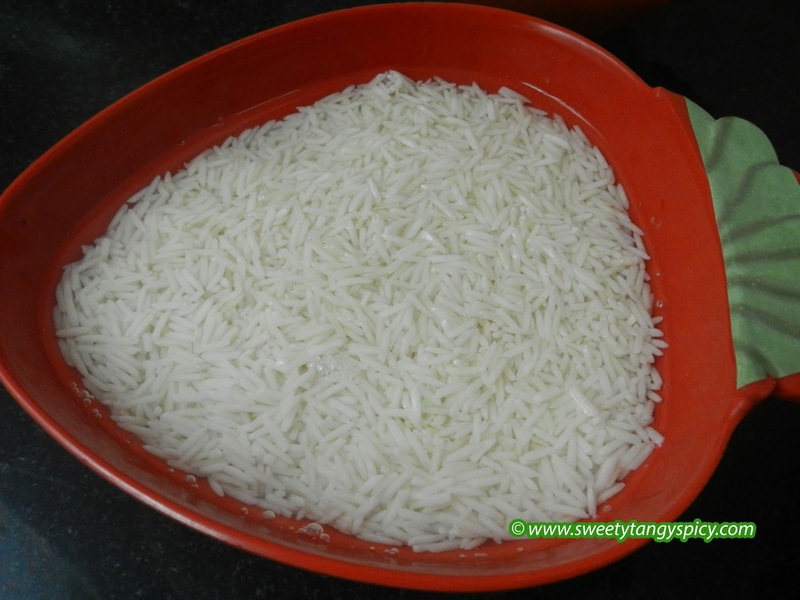 Then soak rice for 20 to 30 minutes before starting preparation. Later strain and keep aside. Heat about 5 cups of water in a pan or pot, when water became hot, then add whole spice (1 bay leaf, 4 cardamom, 1" pieces of cinnamon, 5 cloves and 1 mace (crush a little bit with mortar and pestle). 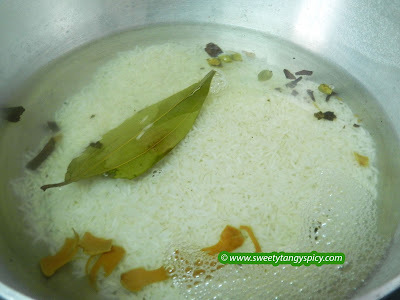 When the water starts to boil on high flame, add the soaked, stained rice. Cook till the rice became 3/4 cooked. Switch off the flame, drain and keep aside. While the rice is soaked in water, you can prepare the masala gravy. Heat 3 teaspoon of ghee in a pan and saute thinly sliced onion in medium flame till they turn golden brown. Remove one or two teaspoons of it for garnishing (You can check my post barista or fried onions for more details). Meanwhile, crush 7 to 8 garlic cloves, 1" piece ginger and 3 green chilies into a paste and add into the browned onion and saute till the raw smell of ginger and garlic leaves. 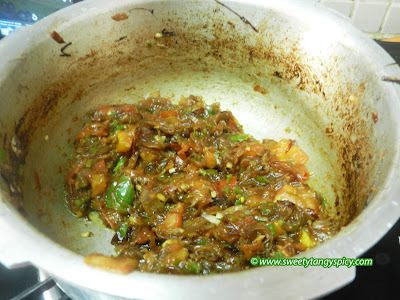 Add 1 large tomatoes, chopped and cook till the tomatoes turn soft. 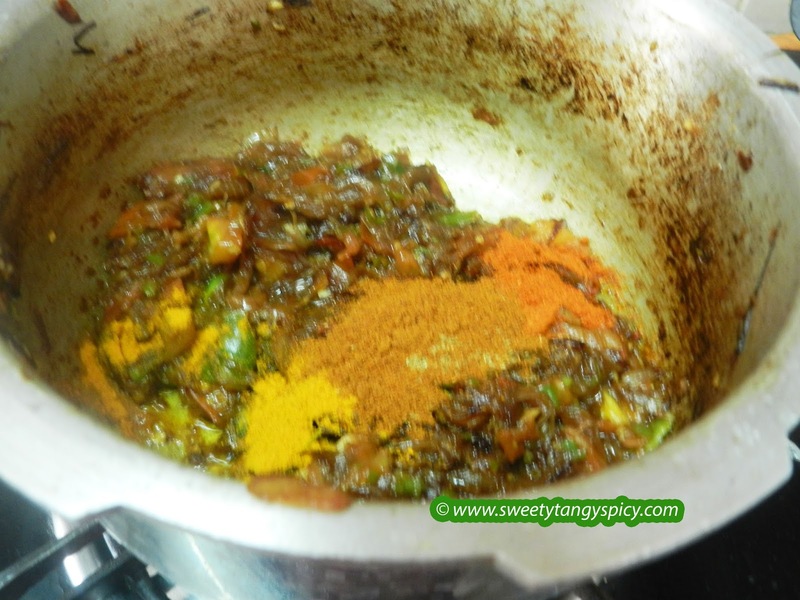 Now add in all the spice powders like 1/2 teaspoon turmeric powder,1 1/2 teaspoon chili powder,1 teaspoon coriander powder,1 teaspoon biryani masala and saute for a few more minutes. 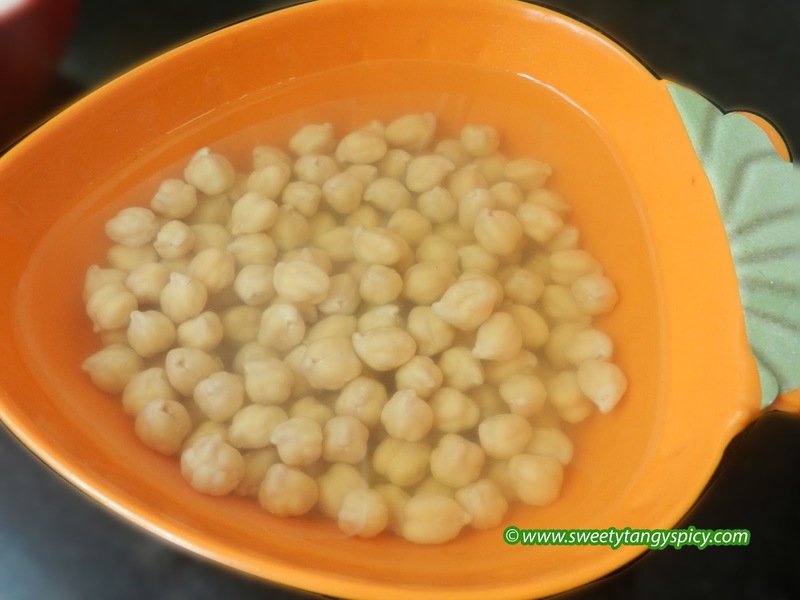 Combine chickpeas, 2 teaspoon chopped mint leaves and 2 teaspoons coriander leaves and one and half cup of water and cook for about 4 to 5 whistles till the chick peas cooked well and turn soft. Once the pressure settles down on its own, add salt as required and cook for 4 to 5 minutes on low flame till the chickpeas absorbs salt. Spread all the rice over the chickpea gravy and also add barista or browned onions, mint leaves, coriander leaves and also a few drops of pineapple essence. 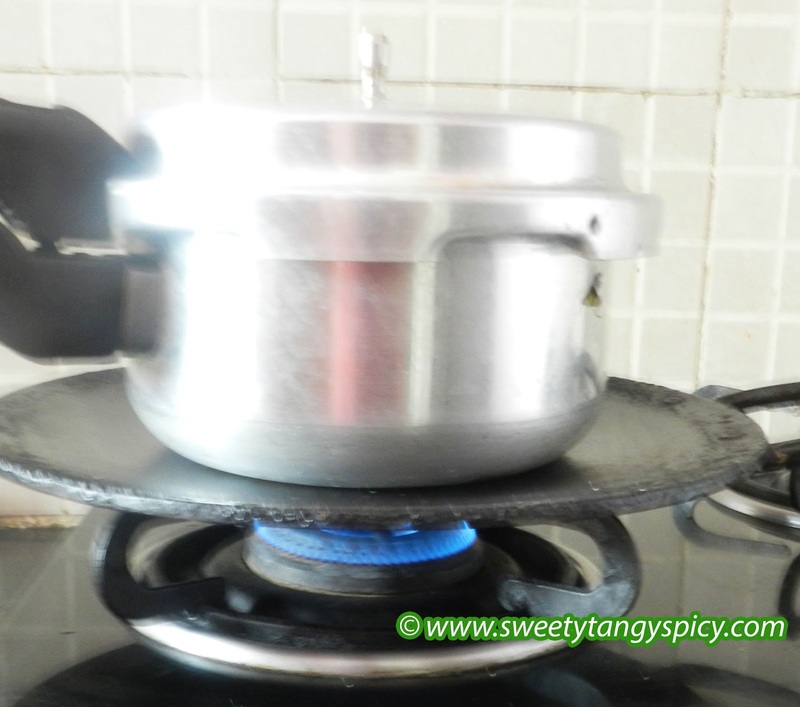 Remove the vent weight and keep the pressure cooker on low flame for about 15 to 20 minutes. Open the lid only when you want to serve. Serve with raita and pickle. Then soak rice for 20 to 30 minutes before starting the preparation. Later strain and keep aside. Heat about 5 cups of water in a pan or pot, when water became hot, then add whole spice (1 bay leaf, 4 cardamom, 1" pieces of cinnamon, 5 cloves and 1 mace. Crush before use. Add salt as required. While the rice is soaked in water, you can prepare the masala gravy. 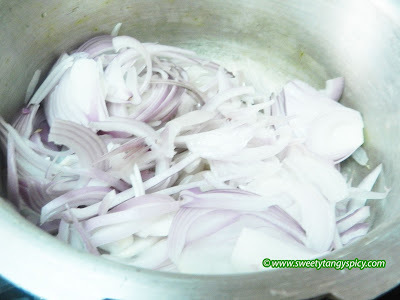 Heat 3 teaspoon of ghee in a pan and saute onion in medium flame till they turn golden brown. 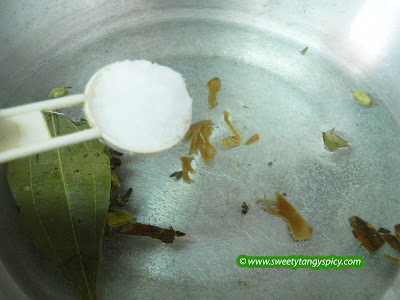 Remove one or two teaspoons of it for garnishing (You can check my post barista or fried onions for more details). 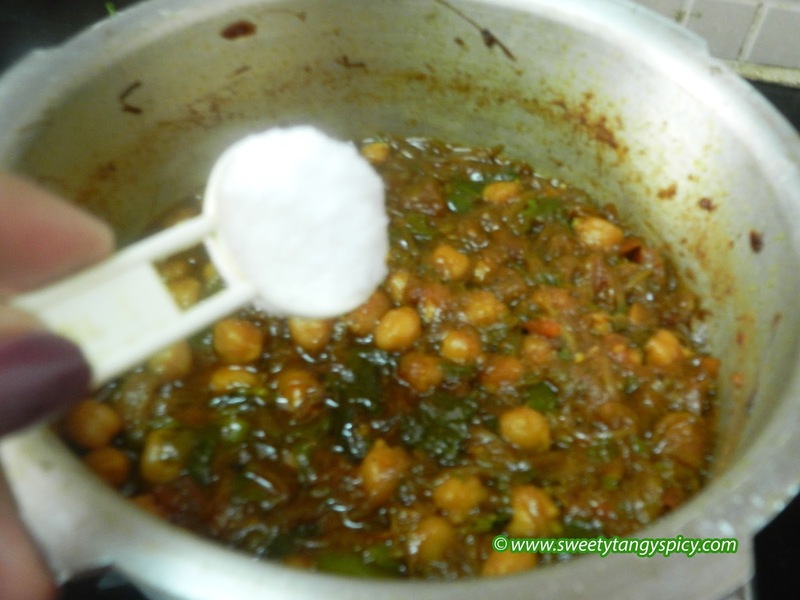 Combine chickpeas, 2 teaspoons of chopped mint leaves and 2 teaspoons of chopped coriander leaves and one and half cup of water and cook for about 4 to 5 whistles till the chick peas cooked well and turn soft. Once the pressure settles down on its own, add salt as required. 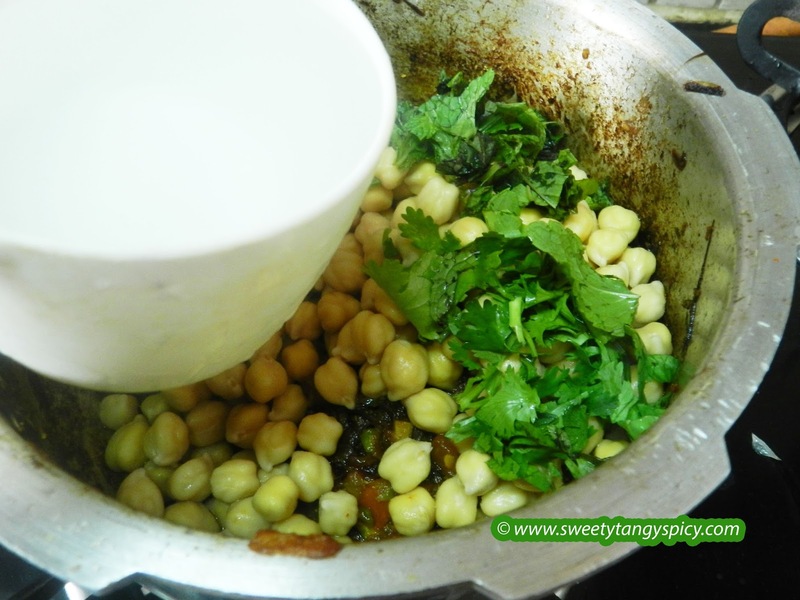 Cook for 4 to 5 minutes on low flame till the chickpeas absorbs salt and the gravy thickens. Spread all the rice over the chickpea gravy and also add barista, mint leaves, coriander leaves and also a few drops of pineapple essence. Remove the vent weight and close the pressure cooker. Place the cooker on an iron skillet and keep on low flame for about 15 to 20 minutes. 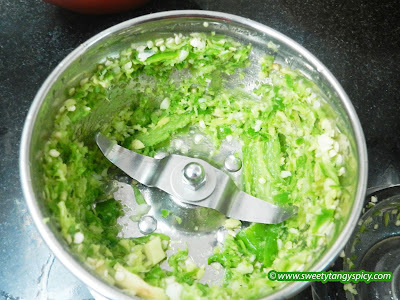 Open the lid only when you want to serve Mix everything well and serve with raita and pickle. 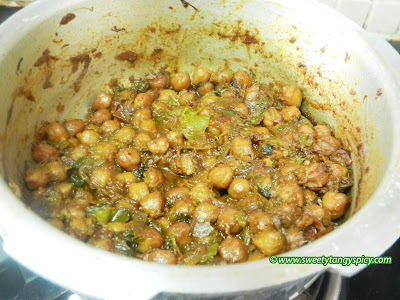 You can combine cooked chickpeas with the gravy, but I prefer to cook chickpeas within the biriyani spices itself. Because by doing so, the chickpeas absorb the spices well and results better taste. 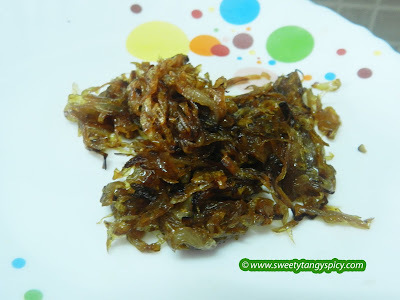 I didn't use any curd or coconut in this recipe, if you need you can add.